Verka Serduchka is the drag persona of Ukrainian artist Andrey Danilko, and an icon across the post-Soviet world. How does an outrageous queen like Serduchka capture hearts in countries plagued by homophobia? Can you imagine a man in full drag complete with bright lipstick, fake breasts and shiny crystal-encrusted headpiece jumping across the screen of a state-controlled TV channel in some of the least LGBTQ-friendly countries of the former Soviet Union, while the audience applauds gleefully and sings along? You’d need either a powerful imagination, or to know about Verka Serduchka, a one-queen act that made Russia, Ukraine and Belarus (as well as other post-Soviet countries) fall in love with drag without fully realising it. 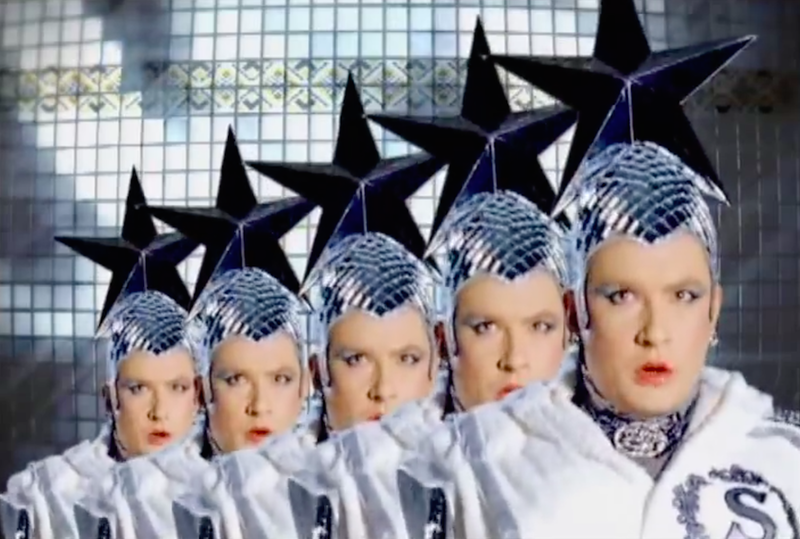 The man behind Verka Serduchka is Andrey Danilko, a 44-year-old Ukrainian artist who first found local pop fame with his drag persona in the late 90s before expanding across the post-Soviet space several years later. 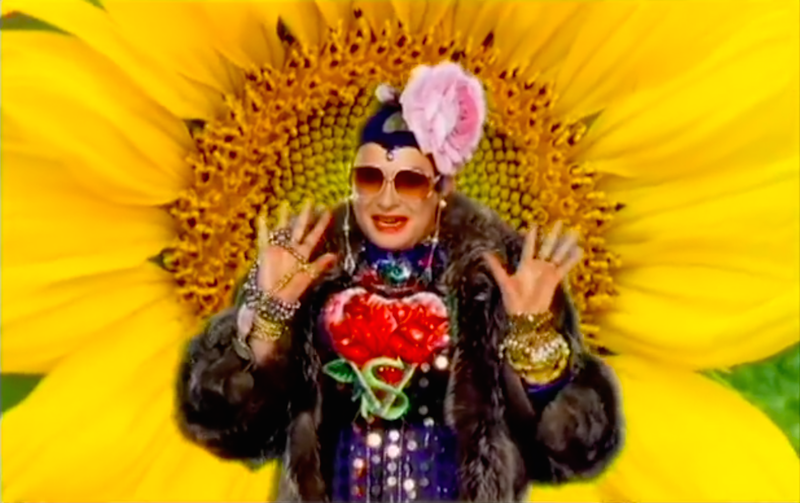 Since 1998, Verka Serduchka has put out 12 albums, received multiple awards, hosted her own TV show, took part in several films and TV musicals and performed at Eurovision in 2007, where her song Dancing Lasha Tumbai took second place and was immediately declared “the best song to never win Eurovision” (it also succeeded in causing a stir with its chorus, a little too phonetically close to the phrase “Russia goodbye”). She also had a cameo in the 2015 Hollywood film Spy, where she was chased around a Paris stage by Melissa McCarthy while performing her Eurovision hit. Serduchka’s schtick is so obvious and genius it makes one wonder why no other drag queen came up with the post-Soviet woman persona earlier. You could point to Katya of RuPaul’s Drag Race fame, a character with a mouthful of a name for anyone who doesn’t speak Russian (Ekaterina Petrovna Zamolodchikova) and a campy take on a resourceful and slutty young woman from Russia, complete with bears and vodka. But ultimately Katya represents a traditional western drag take on a Russian persona, from the stereotypes used (some pretty obvious) to a general drag style that is, some might argue, intrinsically American. Danilko, however, knows very well both the archetype of his character and the audience he is performing to. Serduchka, who is a Ukrainian railroad sleeping car attendant, is rarely overtly sexualised (despite her enormous fake breasts) and speaks her delightful Russo-Ukrainian mixed language directly to the hearts, souls and memories of everyone who grew up post-Soviet. 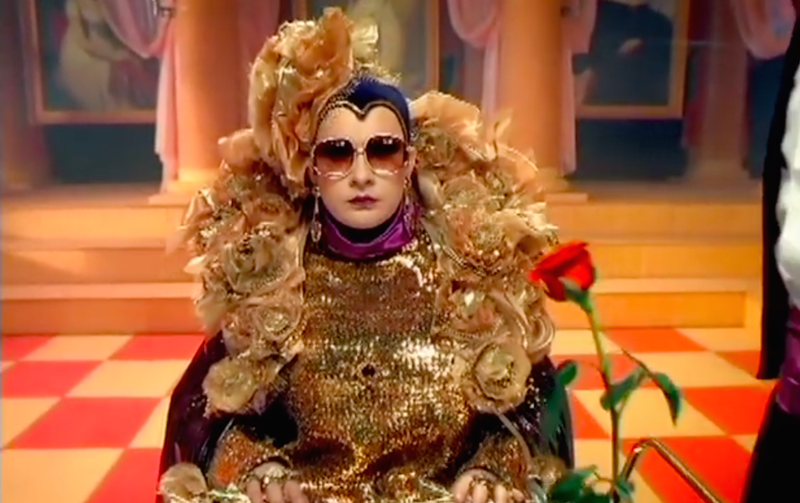 The persona of the straight-talking sassy railroad sleeping car attendant partial to glamorous outfits and horilka, a 40% proof Ukrainian spirit, was established and developed in Serduchka’s own talkshow, SV-Show. The celebrity guests on the show, naturally, were the “passengers”, referencing the heart-to-heart conversations every Russian who has ever taken a long train ride has had with strangers in their carriage. Serduchka’s railroad employee uniform might be sequinned and decorated with boas and playful berets, but the character was true to life on several levels, from trademark little phrases and a flirty but bossy attitude to her sense of aspiration and her relationship with her mother Inna Adolfovna (played by actress Inna Belokon). ​It helps that sleeping car attendants are also ubiquitous characters in post-Soviet culture, the rightful kings and queens of the small domains over which they rule with full authoritarian power — whether they’re giving out bedding or delivering tea in trademark metal glass holders. Serduchka’s character was built from pieces of a million real figures, forged into an archetype so well-known and recognisable that anyone could name a “Serduchka” from their own lives — a family friend, a shop assistant in their local store, a colleague or indeed a railroad employee. For a while, Serduchka’s fame was ubiquitous: she was on countless New Year TV specials and concerts on Russian state TV (which are among some of the most-watched shows in Russia), performed at international talent shows, judged the Ukrainian X-factor and packed out concert halls. In 2013, as Kiev was overwhelmed by the Euromaidan protests, and the country got plunged into the war in eastern Ukraine, Serduchka disappeared. Later Danilko explained that “Serduchka is always a fun party, a celebration, and I think at that moment there was no place for celebrations in our lives.” She still toured in Europe and performed at private parties but public appearances were no more. Serduchka’s major re-appearance was the 2017 Eurovision final in Kiev, where she didn’t even perform but appeared in a series of short clips and opened the televote. This itself angered many, who thought she should have been given a more prominent role because of her “almost victory” in 2007 and cult status in the region (not to mention worldwide among Eurovision enthusiasts). Now Danilko has announced that his career as Verka Serduchka might come to an end in 2018, as he needs a fresh start with a new project. Meanwhile, on Serduchka’s countless social media fan pages, discussions that date back years are carried on as usual: multiple threads whose titles are variations of: “is he a talented artist and transformative genius or just a transvestite?” Even in their love for a drag queen many retain the homophobia and ultra-conservative approach to questions of gender that is ubiquitous in many post-Soviet countries — arguing angrily in defence of Danilko’s “real artistry” and labelling him a “real man”. “Real men”, of course, are not allowed to be drag queens. They are allowed to be “real artists” who dress up to look like women onstage — never mind that the two activities are basically the same. Or could it be, perhaps, that very few of Serduchka’s fans actually realise that their idol is technically a drag queen? Drag culture is either absent or deep underground in most post-Soviet countries, as evidenced by the fact that there is no drag slang in Russian; young people who take it upon themselves to subtitle RuPaul’s Drag Race for their less English-proficient peers have to literally invent words to do so. 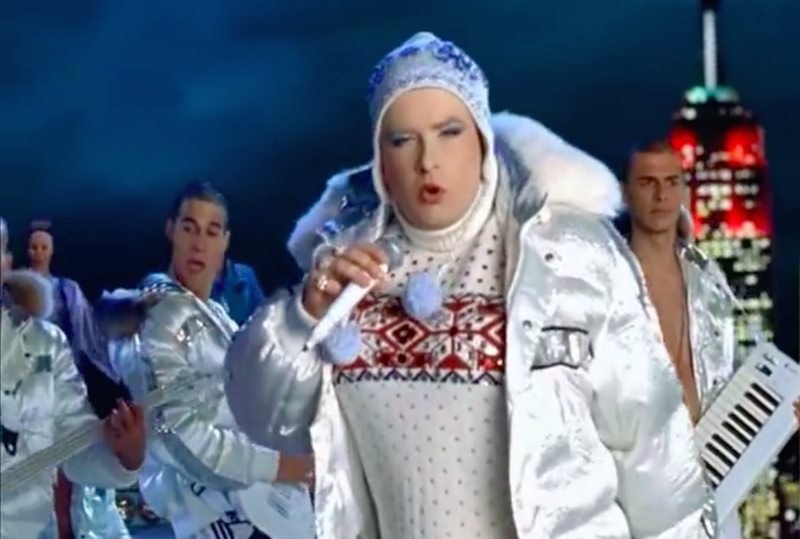 The authentically local post-Soviet character of Serduchka might have — accidentally or on purpose — slipped under a radar that would have been hostile to a western incarnation of drag but sees Danilko as a great entertainer and a comedy genius masterfully executing a brilliant archetype character. 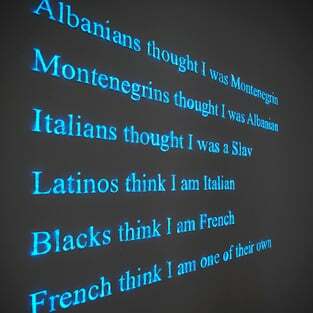 At the end of the day, the choice of words definitely matters. Many would be rightfully annoyed by the naming game that refuses to admit a simple fact: that a drag queen is, well, a drag queen. But then again, another simple fact is that there is a drag queen who is universally adored in countries plagued by homophobia and gender-normative conservatism. Maybe that’s the first step?